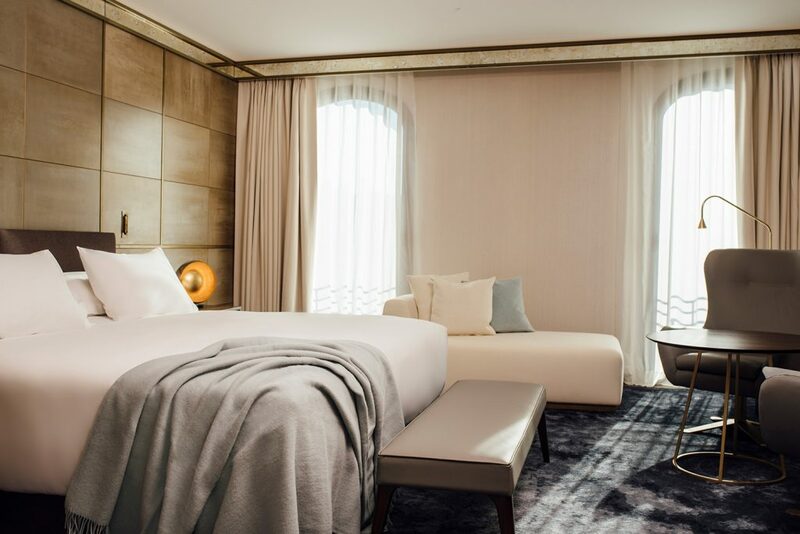 Sitting at the crossroads of elegant Gran Via Boulevard and ritzy Passeig de Gràcia, Almanac Barcelona is the first iteration of its namesake luxury hotel brand. Pairing high touch with high tech, the 91-room property counterbalances all the gadgetry with a human face thanks to its intuitive concierge. 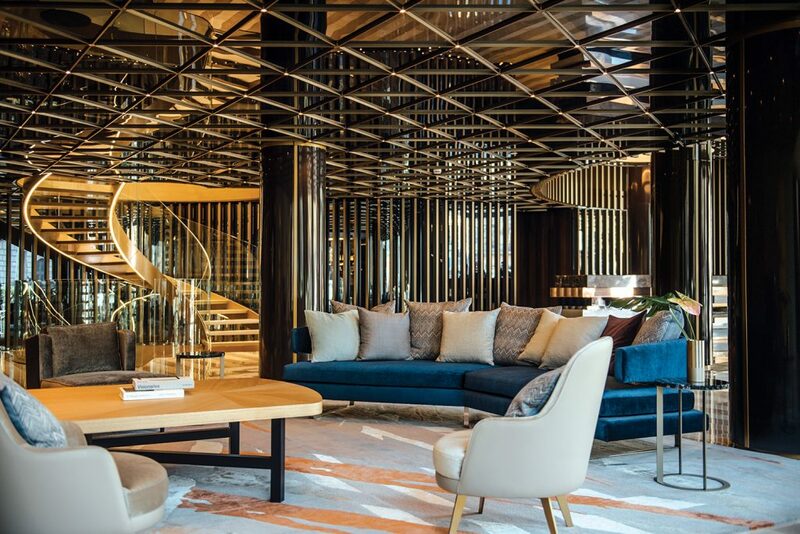 As for glam, the lobby sets the tone with gold-on-grey hues, mirrored and metallic surfaces, and an illuminated spiral staircase that begs to be draped over. The man behind the modern-meets- art-deco-opulence is award-winning local interior and landscape architect, Jaime Beriestain. Gutting two 18th and 20th-century corner buildings was a painstaking job, but one that’s paid off if my Juliette-balconied junior suite is anything to go by. Natural woods and gold tones combine with design-led accessories like low hanging drum lamps and a custom made bed from Austria (complete with doughy pillows). 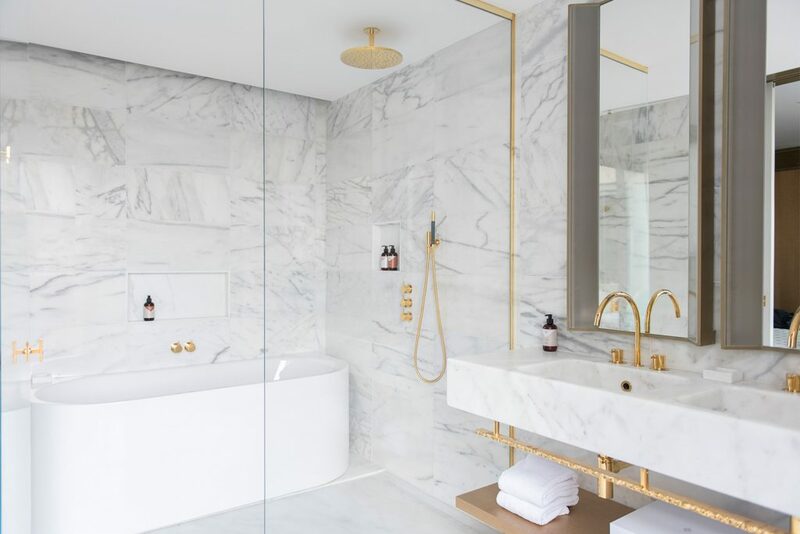 The bathroom, meanwhile, is a vision of wall-to-wall Ibizan marble, graced with double-sink vanities and bespoke toiletries by local perfumer, Jimmy Boyd. There’s also a tricked-out toilet to compliment the smartphone that doubles as a room controller. With free unlimited local and international calls granted to guests, on (and off) the property, it even trumps the complimentary minibar! If you’re wondering where the best reception to buzz Australia is, head to the multi-tiered rooftop terrace and bar. 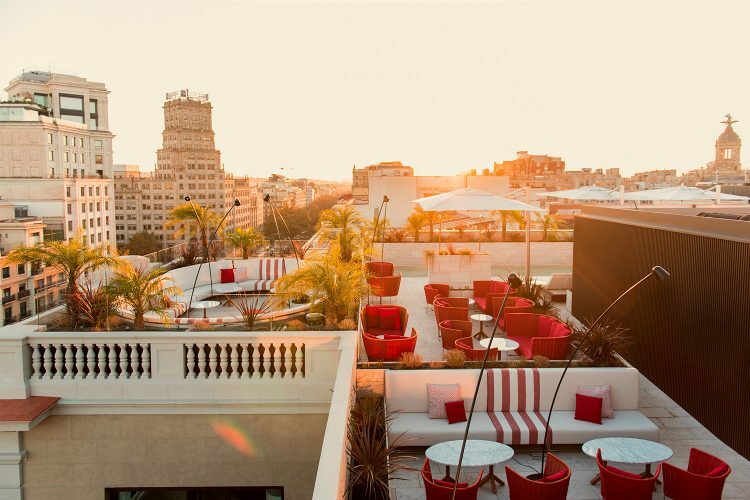 There are few better places in the city to drink up views of Tibidabo Mountain and the eternal Sagrada Família, a glass of the hotel’s special-edition cava in hand. 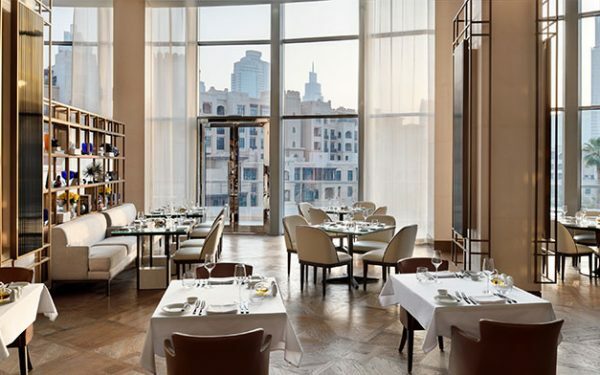 Back on ground level, sink into a velvet booth at Mediterranean brasserie, Línia, and dine on charcoal-grilled octopus, washed down with Catalonia’s finest vintage. As barrios go, Eixample has the full package. Pronounced ‘ay-sham-pluh’, the city’s art nouveau district is home to some of the city’s finest Modernist architecture. 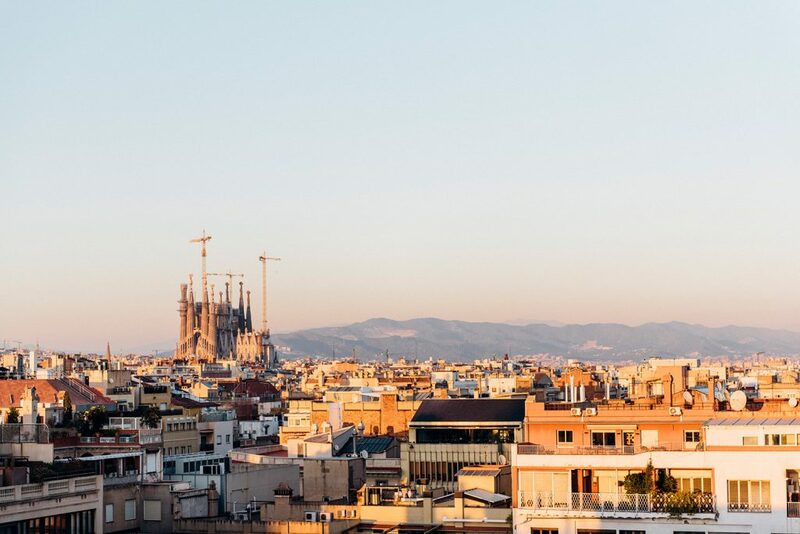 There’s green oases like Park de Joan Miró and Placa de Gaudí, Barcelona’s famous shopping drag; Passeig de Gràcia, and the 18 towering Gothic spires of Gaudi’s Sagrada Família. 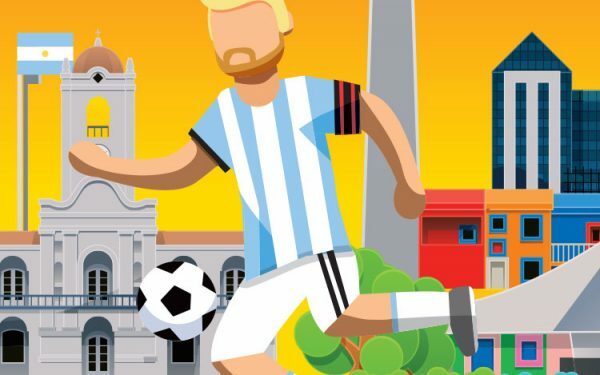 Its wide boulevards and grid layout make it a breeze to navigate on foot, lined with ple-nty of tapas joints like Morro Fi and Bar Tossa to fuel your explorations.